Looking for tough and dependable t shirts and custom printing services near Portland or Lake Oswego? 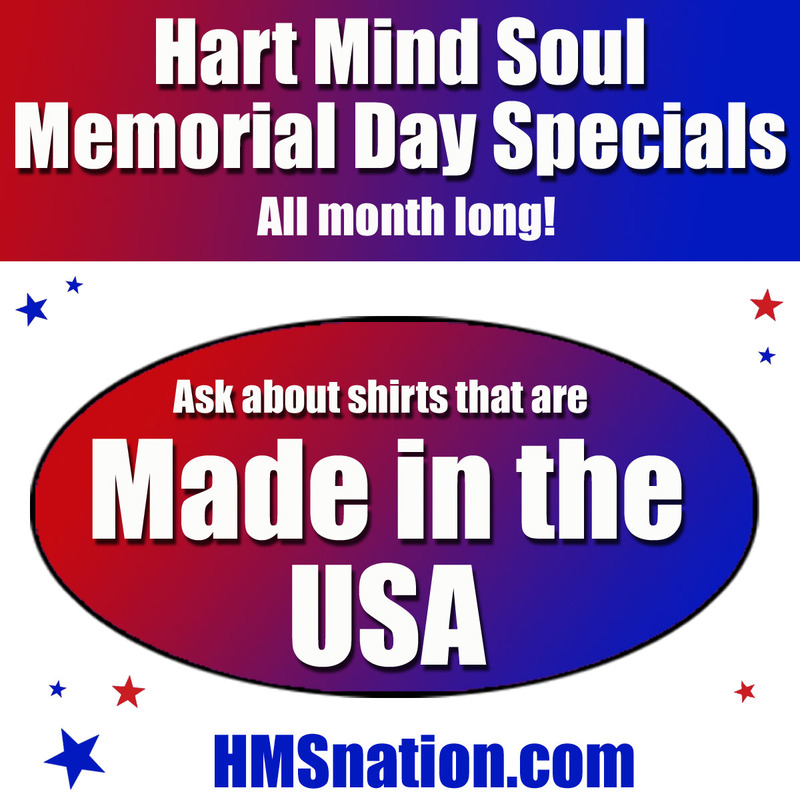 Ask HMS about Memorial Day Custom Printing specials on Stickers and USA made T-shirts from Hart (Heart) Mind Soul and the HMS nation. Hurry! Offer end soon. Contact Hart Mind Soul, Portland’s premier custom printing and sticker expert for online deals, discounts and special Memorial Day savings on select products and styles. Need custom screen printed T-shirts for a summer camp, baseball team, or youth group? Contact the printing industry experts at Hart (heart) Mind Soul in Portland, Oregon for all your Summer apparel printing needs. From tank tops and racer back shirts for women to men’s and ladies DryFit performance, moisture wicking t-shirts and long sleeve shirts to help you stay cool. Beat the heat this summer in Portland, OR with online Memorial Day specials on select fashion and styles from Hart Mind Soul and the HMS nation. Where do I find the BEST sticker printing services in Portland? You can ask google, or you can simply ask HMS. From glow in the dark ink, custom foil enhancement, embossing, extended life bumper stickers, sequential numbering, scratch and sniff, to gloss, matte, and florescent vinyl, die cuts, and specialty shape stickers Hart (heart) Mind Soul and the HMS nation are Portland Oregon’s BEST custom sticker and label distributor. Contact us for details on Memorial Day Weekend Specials in the Portland and Beaverton area. Where do I get the best custom screen printed T-shirts and Stickers near Portland, Oregon? The answer is easy. Fast and courteous t shirt and sticker printing services from the professionals at Hart (heart) Mind Soul custom apparel. Proudly serving the greater Portland area for over a decade, Hart (heart) Mind Soul and the HMS nation understand quality custom apparel and top shelf level garments. Best sticker specials Portland, heart hart mind soul, hms nation portland, memorial day printing specials Portland, Memorial Day Weekend Sale Portland. Bookmark.